Face Unlock On Galaxy Nexus Is Very Neat, But Easily Compromised With a Picture? 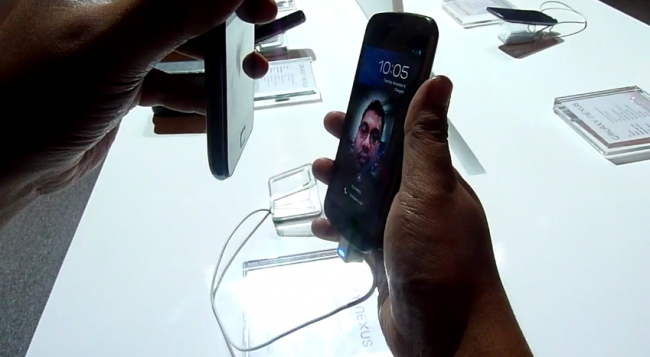 The world was introduced to the Galaxy Nexus’ facial recognition setting at the Ice Cream Sandwich launch. While it may not have worked perfectly in the dim lighting on stage, most of us were still impressed. Hold your beautiful mug in front of the camera and the phone will recognize you and unlock itself. True definition of a smartphone. But what happens when you use a picture of yourself instead of your actual face? A video showing a man holding a picture of himself in front of the G-Nex that is programmed to recognize his actual face (not the picture like he accidentally says in the video) to unlock it has just surfaced and it reminds everyone that maybe your face isn’t the best way to keep your device secure. Not that any of us thought that it would be. Cool trick to show off to your friends, but after that it doesn’t serve a very useful purpose. Full video down below.